1 Place the town board in the center of the table with the Official Librarian License Application S-42a nearby. 2 Gather the 10 location tiles with the solo compatible icon underneath the number. Leave the 8 incompatible location tiles in the box; they are not used in solo games. Shuffle the solo compatible location tiles, then deal 6 onto the bottom section of the town board (they will overhang slightly). Place the remaining 4 tiles in a face-down stack nearby. 3 Gather the 7 library tiles with the solo compatible icon to the right of the assistant spaces. 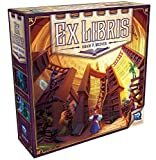 Leave the 5 incompatible library tiles in the box; they are not used in solo games. Shuffle the solo compatible library tiles, then draw 2. Choose I of these 2, then return all others to the box. 4 Take the special assistant that matches your library and three standard assistants in the color of your choice. 5 Shuffle the category cards and place I face up on the Prominent Works space on the town board and I face up on the Banned Books space. Additionally, deal I face down to the Public Library Focus space of the Official Librarian License Application S-42a without looking at it. 6 Deal I of the remaining category cards to yourself for your library's focus. Place the 2 remaining category cards face down on the top space of the Official Librarian License Application S-42a without looking at them. 7 Shuffle the book cards thoroughly, then draw 6 to form your starting hand. 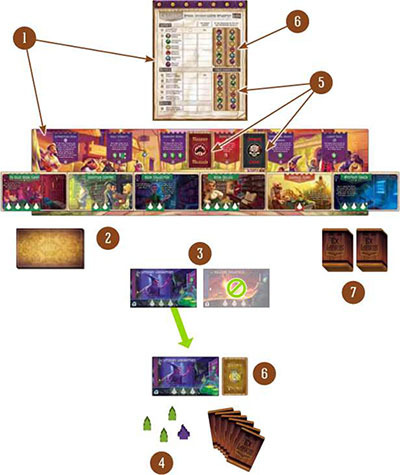 Place the remaining book cards in two roughly equal stacks near the board. These will be the deck. Unlike the multiplayer game, new location tiles are not revealed during the Preparation Phase. Instead you will discard a number of book cards from the deck each round. The number you must discard is determined by the difficulty level you choose to play. We recommend starting with the beginner level until you are familiar with the differences in game play. You may examine book cards as they are discarded, but you may not look through the discard pile otherwise. Only the top card of the discard pile should be visible. Next, follow the preparation instructions on each of the face- up location tiles in the same way as the multiplayer game. Note: At the beginning of the 2nd and 4th rounds, prior to discarding book cards, reveal one of the category cards from the top space of the Official Librarian License Application S-42a, then return it to the box. This will help you narrow down what the public library's focus might be. The Placement Phase works in the same way as the multiplayer game, except only one of your assistants may be present on a location tile at any given time. When you have placed all four of your assistants, cariy out the steps of the Resolution Phase in the same way as the multiplayer game. At the end of the fifth round, when all the location tiles have been eliminated, the solo game ends. Cross your fingers and continue to Game End & Scoring. First, you must discard all cards remaining in your hand. Next, spread the discard pile out into several columns so that you can see and easily count all the category icons on each card. You will now use the Official Librarian License Application S-42a to calculate your score. Note: Remember, the public library is represented by the entire discard pile. Spread all the cards in the discard pile out in such a way that you can see all the category icons. Check your bookshelf for alphabetical order as normal. The public library does not check for alphabetical order. (The public expects it to be a mess). Next, for each category, record the total number of matching individual books in both your bookshelf and the public library. Survey your shelf stability as normal. The public library does not survey shelf stability. (Years of neglect have resulted in piles of books everywhere in lieu of shelves). Circle the row in the categorical tally section that matches the category card dealt to the Prominent Works space on the town board. If you have the higher number in this row, you are awarded 15 points. If the public library has the higher number in this row, they are awarded the 15 points instead. There is no second place award in the solo game. The public library wins all ties. Draw a zig-zag line around the row in the categorical tally section that matches the category card dealt to the Banned Books space on the town board. Assign yourself a -1 point penalty for every banned book in your bookshelf, then do the same for the public library. Find the category you have the fewest books of, ignoring Banned Books, and multiply that number of books by 3 points to determine your variety bonus. Do the same for the public library. Score 2 points for every book in your bookshelf matching your library's focus, then reveal the public library's focus and do the same for the public library. Finally, add up all the figures in section B. If your score exceeds the public library's score, you win! If there is a tie, or if your score does not exceed the public library's score, you lose.